There are two basic ways to season wings—with a wet marinade or a dry rub. Wings take nicely to marinades, which is a very popular way to season them. Once prepped, place your wings in re-sealable bag or a container and then add your favorite marinade. Let them soak for at least an hour prior to barbecuing. 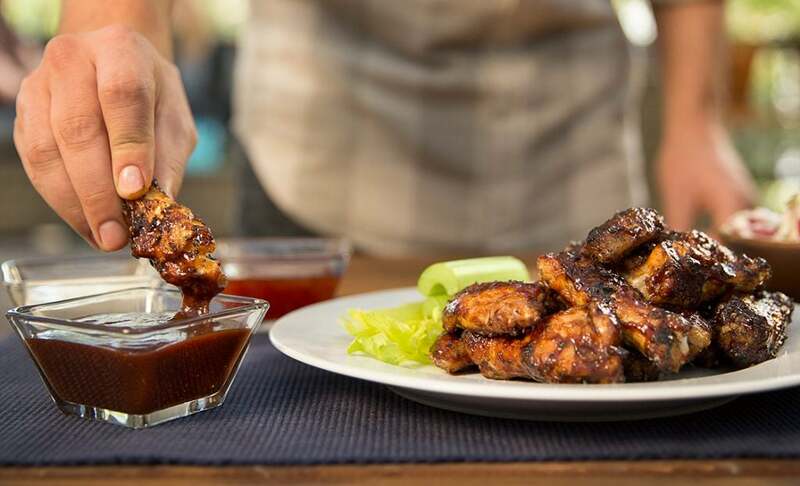 If dry rubbing, simply apply your favorite barbecue rub or dry seasoning to the raw chicken wings prior to barbecuing. Once browned on all sides, move the wings over to the cool side of the BBQ to finish cooking through. Place the lid on the BBQ and let them cook until the wings reach a safe internal temperature of 165°F. An instant-read digital thermometer will come in handy for checking doneness. In general, the wings take 8 to 10 minutes to finish cooking through.